Leading pitched roof tile manufacturer, Russell Roof Tiles, once again swung for charitable causes with its golf tournament which raised over £5,000 for its Community Fund. Held at Burton Golf Club, over 70 people attended from varying companies within the Construction industry including Avonside Roofing, Liberty Roofing, Procter Johnson and Cemex. Numerous other organisations participated, such as Vortex, Vodafone and Burton Albion Football Club. 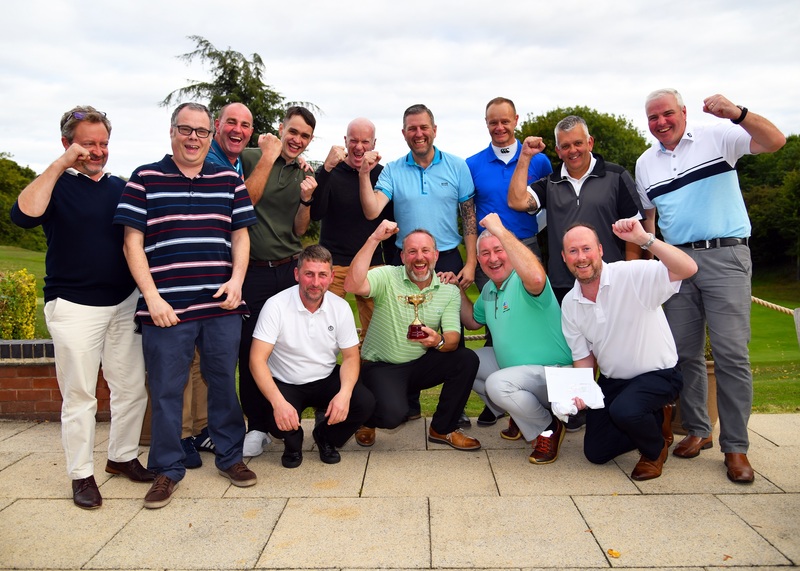 The annual golf day, organised by Area Sales Manager Ross Hayward, has been running since 2016 and is a hugely successful part of Russell Roof Tiles fundraising, with the company having raised a whopping £7,500 so far. On the day, the attendees were split into two teams – ‘Team England’ and ‘Team Rest of the World’ – with the Rest of the World team coming out on top with a score of 13-5, earning themselves the ‘Russell’s Ryder Cup’. ‘Rest of the World’ Captain Harvey Jackson and his partner Nick Hamilton from Procter Johnson also picked up the award for ‘Best Scoring Pair’ with an impressive 75 points. Funds raised at the golf tournament will go directly towards Russell Roof Tiles Community Fund, which will see a number of local charities and community organisations benefit, including Shropshire.Staffordshire.Cheshire Blood Bikes, Dumfries and Galloway Blood Bikes, Nith Inshore Rescue in Lochmaben and Mona C Allotments in Burton on Trent. Russell Roof Tile launched its first Community Fund in 2017 to allow a number of charities to share, local to its three sites to benefit from a fundraising pot. Having raised £63,000 for a variety of charities since 2015, Russell Roof Tiles has hosted a number of charity events from Strictly Come Dancing style competitions to family fun days in order to raise money for local good causes charities. The roof tile manufacturer has always been dedicated to supporting local organisations in the community. Russell Roof Tiles next major event will be its Annual Quiz and evening of competitive quizzing, charity raffle and auction at The Pirelli Stadium in Burton on Trent on Thursday 15 November. Last year an impressive 48 teams battled it out for the ultimate Big Quiz champion title but it was Russell’s Production Director in Lockerbie, Bruce Laidlaw and his team Hadrian’s Fall who finally took home the prestigious title.